Remember when I told you I’d watched “Zodiac”? After returning it to the video store, I decided to get two more movies. I was in a hurry and did not think much – sort of grabbed whatever was in front of me, because those were movies I’d been dying to see for ages. Do you know what I got? “Blindness” and “Eternal sunshine of the spotless mind”. Yes, my friends - three movies with Mark Ruffalo in just one week. Sometimes I get stuck with something and my mind has a hard time letting go. That’s why I give you the combo lime + white chocolate again – this time, in cookie form. Preheat oven to 180ºC/350ºF; line two large baking sheets with parchment/baking paper. In a large mixing bowl using a stand mixer, beat sugar, brown sugar and butter until combined but not fluffy. Add eggs one, at a time, then add vanilla, lime juice and lime zest. Mix to combine. Sift together flour, baking soda, baking powder and salt. Mix into creamed mixture until just combined. Fold in the white chocolate chips/chunks. Shape the dough into 2.5cm (1 inch) balls and place 5cm (2 in) apart on prepared baking sheets. Bake for 10 minutes, or until the edges are golden and the centers are just set – mine needed 15 minutes. Allow to sit on the pan for three minutes before moving to wire racks. Your cookies look really pretty! I hope you enjoyed them!! These cookies look so nice and I say lime and white chocolate is a fantastic combo. I didn t like the film . Eternal sunshine of a spotless mind. Gorgeous pic! I LOVE Eternal Sunshine, and I think I'd probably love these cookies, too. Good choices! I made a similar cookie recently, only mine had oatmeal. YUM to both versions! Never thought about that combination, but sounds really good. I will try this recipe for sure. Thanks for the great idea! An unusual combination, but one I would like to try. They sound great. What a cute idea to put them in empty tin cans wrapped with ribbon--would be a great gift. 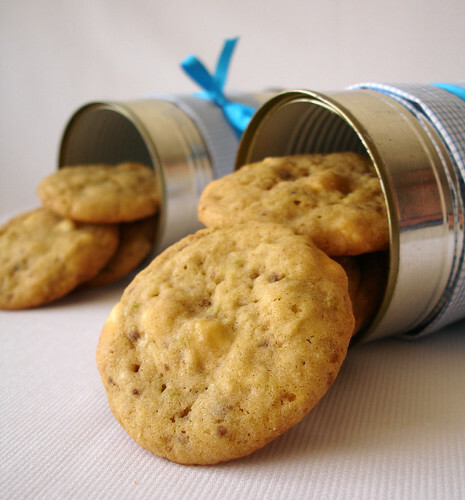 The cookies sound great, I love the tin cans with the ribbon! So cute! Remind me to tell you sometime about a horrible first date invovling Eternal Sunshine of the Spotless Mind! Haha, anyway, these cookies look amazing. I'm all for repeating these fabulous flavors. What a great flavor combination! I've never tried white chocolate and lime together before but I can imagine it would taste wonderful. 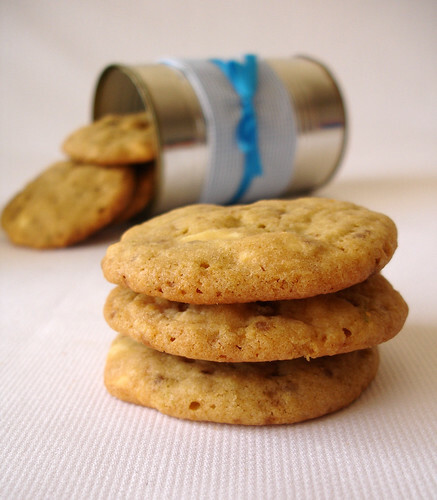 I LOVE you for this recipe.. Lime and white chocolate in a cookie.. you are my new food guru!! AWESOME! I love your flavor combinations! And lovely photos. And Eternal Sunshine is one of my favorite movies. Natalie, really, darling? I liked it! Abby, thank you! Love the movie, too! Crystal, thank you for stopping by! I hope you try it. Simone, I did like it - but liked "Blindness" a lot more. Julia, I'm glad you like it, tks for stopping by! Katie, thank you - hope you try it! Donna, thank you for such kind words! Melanie, tks for stopping by! And that movie became one of my favorites, too. 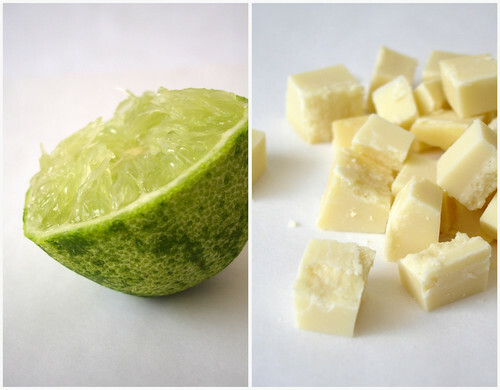 I always find white chocolate way too sweet, so I love the idea of the tartness of the lime for balance. Will have to try these! I haven't seen any of the movies but your cookies OH MY! They look perfect - what a combination! Mmm those are perfect little cookies! I love the white chocolate & lime combo in cookies. This article really a delicious article. And its so nice and very great blog. Thank you for sharing. Marghe, thank YOU for letting me know how they turned out - I'm glad you liked them!